This coming Saturday the DabbledooMusic Project moves into its next gear. Although workshops are a great way to introduce young musicians to the idea of using graphic notation to explore music making, an hour is never enough to cover the range of possibilities available. 6 hours over 6 weeks is probably enough time to just scratch the surface, but starting this Saturday that is what 12 kids between the ages of 6 and 12 will attempt with myself and Killian Redmonk leading the group. 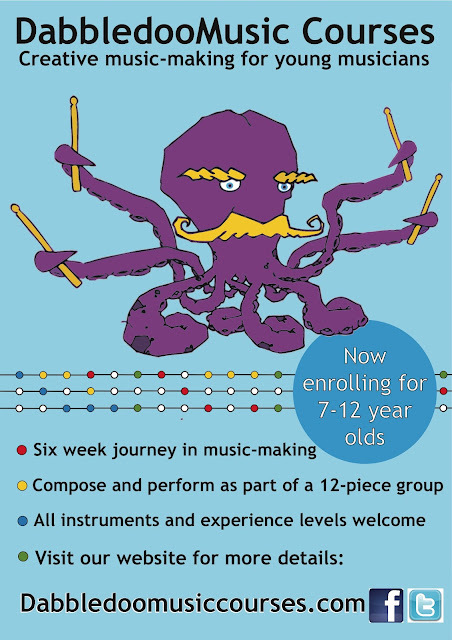 Each week a different area of music making will be explore using the free online resource, DabbledooMusic, and a number of worksheets for the participants to record their own creations and ideas.